Dermot O'Neill kindly wrote the following piece in the RTE Guide recently about these wonderful Lupins. "For many years, I tried to get hold of a group of varieties called West Country Lupins, which are exhibited at the Chelsea Flower Show. Each year, I would ask, only to be told they were not prepared to post to Ireland. To my great delight, Camolin Potting Shed in Co Wexford, recently started to stock a wide range of named West Country Lupins. 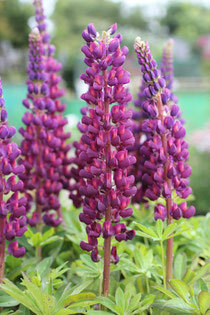 These lupins are distinctive as they have exceptionally good colours and they make sturdy, strong plants that don't need staking. For example, one variety currently available is 'Masterpiece', which produces rich purple flowers with small orange flecks. The contrast is absolutely stunning. 'Masterpiece' is just one of many different named varieties which will be on offer this spring at Camolin. Lupins enjoy a sunny position in good quality, well drained soil and its a good idea to prepare the ground in advance, digging in organic compost of well rotted farmyard manure. I use Gee-up which is made from composted stable manure." Many thanks to Dermot for this piece in the RTE guide.